The first few days of school are a vital time to set the right tone for the rest of the year. Many teachers focus on important things like getting to know their students, building relationships and making sure students know what the classroom procedures will be. While those things are important, Alan November, a former teacher-turned-author and lecturer says the most important ideas to hammer home will help students learn on their own for the rest of the year. 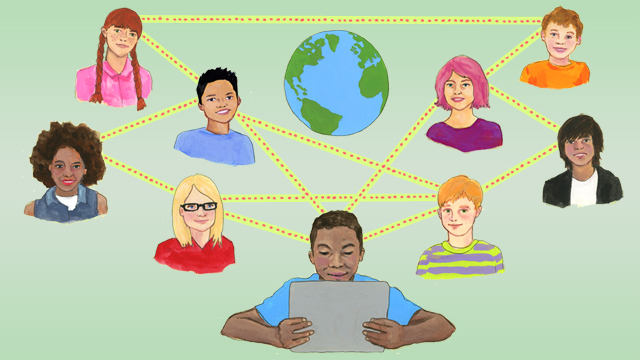 “The name of the game is to find the right information with the right question,” said November during a workshop at the 2014 gathering of the International Society of Technology in Education in Atlanta. “My job used to be to give you the information, now my job is to teach you how to find the information.” November firmly believes this dynamic needs to be made very clear in the first five days of school. "The best teachers were kids who had really struggled with the material and really understand what it's like to learn." Kids think they know how to use the internet to search and find the information they need, but November has found through many interviews and school visits that often students have no idea why Google or any other search provider works the way it does. And they don’t know how to phrase questions to get the answers they seek. “Kids literally take their teachers assignment and Google it,” November said. “They don’t understand that Google doesn’t speak English or any other language.” He’s tested his theory in classrooms, asking students to research the Iran Hostage Crisis. Students inevitably Googled the event and cited the first few pages that came up. But every resource was written from a U.S. perspective on an event that affected two very different countries. “Your kids are not thorough,” November said to the hundreds of educators gathered. “They don’t see what they don’t see, so it’s really important that teachers challenge what’s missing.” Even more important is for students to learn the syntax of searching. To find sources from Iran students need to type “site:ir” in order to direct a search engine to explore that part of the internet. Even using that trick doesn’t solve the problem because Iranians don’t call that event “Iran Hostage Crisis,” they call it "Conquest of the American Spy Den." “It’s my observation that we are not instilling a discipline and rigor of the grammar and syntax of the tool they are going to use more than anything else for homework,” November said. And worse, when he asked kids about the kinds of assignments teachers give, students said 85 to 90 percent of the answers could be found with a quick internet search. “I think we should give kids problems that you can’t look up on the internet,” November said. “Or, if you do, build the capacity to do it well.” With the Iran Hostage Crises example, a teacher could require that students use sources from Iran, and could spend time brainstorming the right questions to ask a search engine to get the best information. These skills will help students throughout the rest of the school year and should be covered early. “In the first 5 days I think we should front load really high level research skills,” November said. That means teaching students to “power search” using Google operators, the words that define how Google searches. “A lot of kids have never used the advanced system of Google algorithms,” November said. Without it, the internet is a vast space with little organization. November compared power searching to the Dewey Decimal System in a library – without it people are just wandering around a building hoping they find the right book. Another important concept to impart within the first few days of school to students: you can make meaningful contributions to the world, no matter how old you are, November said. He described MathTrain, a website created by middle school math teacher Eric Marcos. Marcos asks his students to make math tutorials to help one another and posts them on the site. Some of the tutorials have been viewed over 50,000 times by people all over the world. When students learn their work can make an impact, they're not only more motivated, but they work harder. “A global audience can be more motivating than a teacher in the classroom,” November said. And kids love to connect with other kids, so why not give them that experience early in the school year and make it a regular occurrence. Most kids say they will ask a friend for help with something they don’t understand before asking the teacher, November said. So why not let kids teach each other and help them see that what they are learning can help others. “The best teachers were kids who had really struggled with the material and really understand what it's like to learn,” November said. “Sometimes teachers suffer from knowing too much. The material they teach is easy to them and it can be hard to empathize with the stumbles of a new learner. Kids who have struggled with the material understand the pitfalls and can often explain them in ways other kids will understand. The school year is often broken into so many units of study, standards to cover and snippets of time, that kids rarely get to work on one sustained project for very long. November is a big proponent of letting kids define and work on a project that has very few parameters and no rubric, and that will be presented at the end of the year. “They resist because they have all this anxiety over the unknown,” November said. “They are seeking safety in your rubric.” But insisting students give it a try can yield strong projects, and more importantly it gives students the experience of defining the project and deciding when it’s good enough. In a computer science class November taught, the most resistant student ended up building a massive database of resources for people with disabilities in her town. She couldn’t finish it by the end of the year, so she came in during the summer to complete the work. “That’s the difference when students define their own problems with intrinsic motivation,” November said. They care so much they're begging for the computer lab to stay open during the summer. One great way to teach students how to learn is to show them how teachers learn and what their sources are. November favors Diigo, but there are lots of sites that help people organize what they’ve read online and share those resources. For teachers who are actively improving their knowledge of the subject matter they teach, why not share that digital library with students and show them what lifelong learning looks like? A great way to do that is through social media, one of the best ways for teachers to connect professionally and find ideas to further their own craft. If Twitter is such an important tool for educators, why keep it from students who also want to know how to connect and build a network? “We should teach them to follow the best minds in the world on whatever their passion is,” November said. He remembers showing a boy interested in becoming an entrepreneur the Harvard Business Review’s Twitter page. The magazine follows heavyweights in their fields, who are accessible to students in ways they never were before the internet, if student know how to look. Teaching students to view Twitter as a research tool, a way to see what the brightest minds in a discipline are thinking and reading is akin to teaching them to search the internet powerfully. It's giving them the tools to continue learning long after the test.